(March 6, 2011) The 2010 census counts were released for North Carolina last week, and they show the 2010 census population of Steele Creek at 52,014, up 106% from the 2000 census count of 25,282. 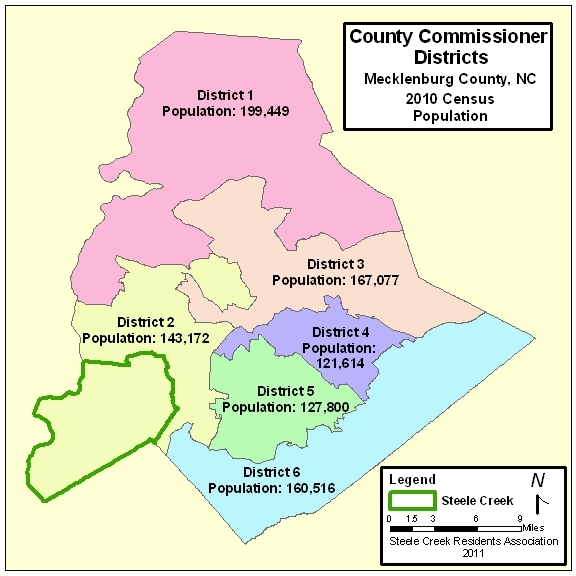 The population of the portion of Steele Creek within the Charlotte city limits was 43,005. Steele Creek increased from 3.6% of the county's population in 2000 to 5.7% in 2010. This is still a small percent of the overall county's population, but new county commissioner and school board districts will be redrawn before the 2012 election to divide the county's population in 6 approximately equal parts. If Steele Creek remains in tact in one district, it will make up 34% of that district. All of Steele Creek currently is within county commissioner and school board District 2. This district had a 2010 census population of 143,172, which is 10,099 or 6.59% below the optimum population of 153,271. It is not possible to know how the district will change yet, but Steele Creek clearly will be a significant part of it. That part of Steele Creek within the city limits increased from 2.9% of the city's population in 2000 to 5.9% in 2010. If city council districts are redrawn to divide the city's population into 7 approximately equal parts and the incorporated portion of Steele Creek remains in one district, it will make up about 41% of that district. The current city council districts are shown below. Districts for the 2011 City Council election must be set before July 25, which is the beginning of candidate filing.